For a chimney to operate satisfactorily it should be smooth, warm and as straight as possible. We advocate flue lining for the following reasons – the liner will decrease the size of the flue which results in higher temperatures being maintained. This in turn means flue gases will travel faster and generate greater, more consistent draft. We insulate the liner, which also increases and maintains flue temperatures. A warm flue collects less deposit meaning cleaning will be easier. In addition, condensation should not occur in the flue. A swept liner will look as clean as new. 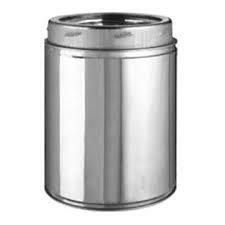 But it is practically impossible to remove all deposits accumulated in unlined flues. There are always corners and holes a brush cannot reach. Most flues can now be swept through the stove, once the baffle is removed. It make sense, therefore, to line the flue with a liner that is the same diameter as the flue outlet making the sweeping process much easier whilst giving excellent results. We recommend lining your flue as part of your installation and see this as good working practice. We offer a choice of twin wall insulated chimney systems to suit all styles of stoves and properties including barn conversions, thatched properties & homes without a chimney. Available in stainless steel or matt black as standard. We can also have the system powder coated to a colour of your choice. Building a new chimney as part of a new build process or extension is easy and economical. We can also advise on appropriate ways to add a chimney to an existing building or to a specific room. Give us a call or visit us at our Essex showroom in Great Dunmow to discuss chimney lining and the chimney systems we offer. We provide chimney lining services to clients throughout Essex and London.